Which banks are foreclosing in Prince George's County? As part of our ongoing commitment to provide the data and tools necessary for the Washington, DC region to address its housing and foreclosure issues, NeighborhoodInfo DC recently released the second in a series of briefs about hard-hit Prince George’s County. Part of this brief focused on six banks that collectively issued two-thirds of all Notices of Intent to Foreclose (NOIs) – the initial stage of foreclosure proceedings – in Prince George’s County from January 2011 to June 2012. In sum, Bank of America, Wells Fargo, JP Morgan Chase, Ally/GMAC, IndyMac and Citi filed NOIs on 35,586 residences, 72 percent of the total. 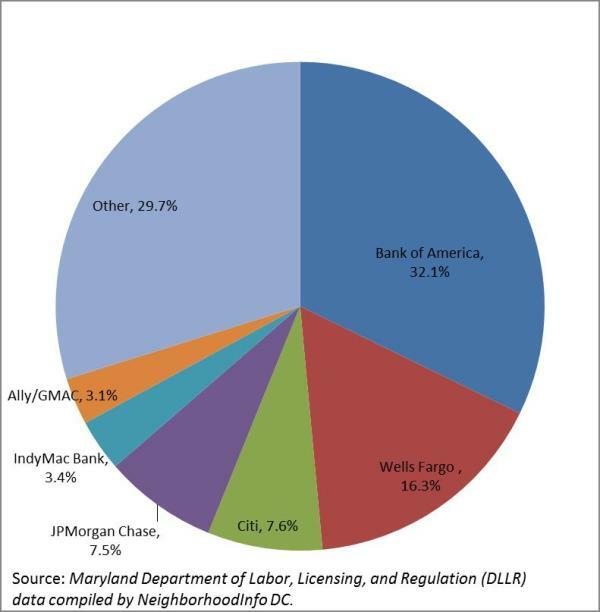 These six banks were all parties to the $26 billion settlement that resulted from “robo-signing” and other irregular foreclosure practices, and which ended up yielding Maryland nearly $1 billion in foreclosure-fighting resources. Determining how, when and to whom to allocate those resources will be crucial for the long-term health of the Prince George’s housing market. Since many of the six-bank NOIs will be eligible for settlement funding, our interactive maps and data showing which areas were worst-hit provide one means of targeting resources effectively in Prince George’s. For instance, in which communities might it make sense to target loan modification? Which communities need wide-spread support like rental assistance, job placement and temporary income support as hundreds of families leave their homes? NeighborhoodInfoDC data and maps, used in conjunction with this Foreclosure-Response.org resource-targeting framework, can help answer these questions. We’ve recently updated the map to include data through June 2012, and we will continue updating the data each quarter. The crisis runs deep and solutions will likely take years to gain traction. Best to get started as soon as possible with data-driven solutions; NeighborhoodInfo DC is here to help.